Soft, moist Banana Chocolate Chip Muffins topped with mini chocolate chips and dried banana chips for a delicious added crunch! 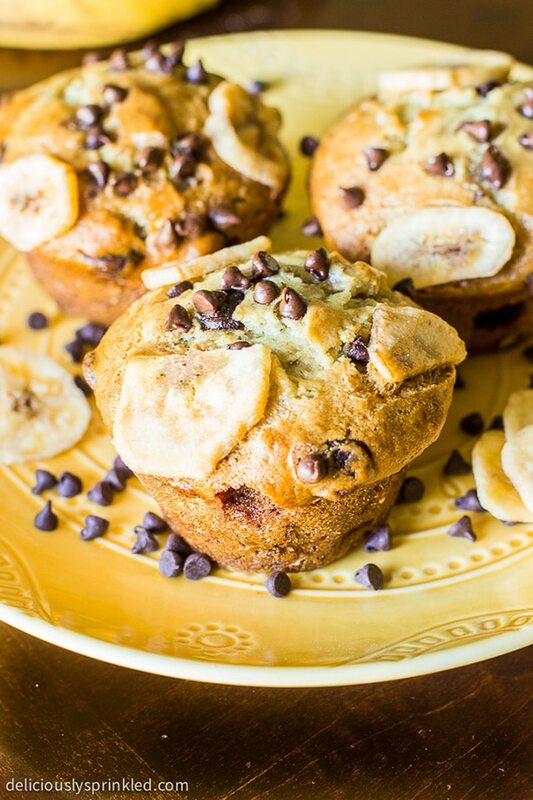 Chocolate chips + bananas= the best muffins ever! These moist, delicious muffins are the perfect way to start your day off right or give you that extra pick me up, as a late afternoon snack. I also love these muffins for dessert because they’re loaded with semi-sweet chocolate chips, my favorite! And not only do I love these muffins because all of the chocolate chips in them, the crunchy banana chips on top really take these chocolate chip banana muffin to the next level. YUM! ✔ I like to use an ice cream scooper to fill the muffin batter into each muffin tin. I think it makes it super easy and you know that each muffin will be the same size. For these chocolate chip banana muffins, I pressed dried banana chips and mini chocolate chips into the top of the muffin batter, but if you don’t want to use banana chips and mini chocolate chips, no worries the muffins will still be just as good! PRE-STEP: Preheat oven to 425F degrees. Spray 12 muffin cups with non-stick cooking spray. Set aside. STEP 3: Add mashed bananas, mix until combined. STEP 6: Using an ice cream scooper, scoop muffin batter into prepared muffin tins. 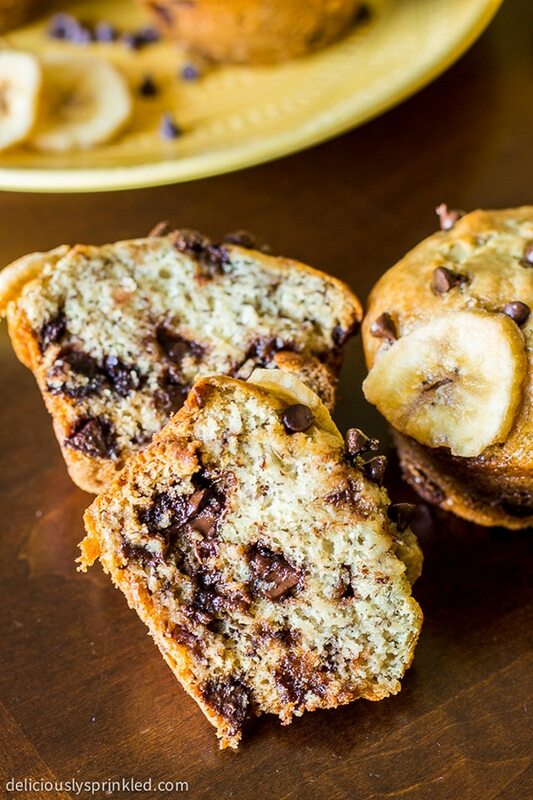 Press dried banana chips and mini chocolate chips into each muffin. STEP 7: Bake at 425F for 5 minutes. Keeping the muffins in the oven, reduce the oven temperature to 350F and continue to bake for 12-15 more minutes or until a toothpick inserted in the center comes out clean. STEP 8: Let muffins cool on wire rack for at least 10 minutes before enjoying. 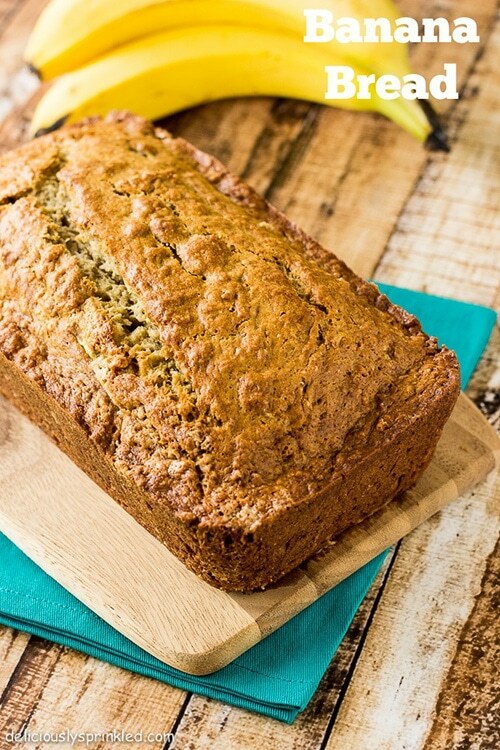 And try this delicious Banana Bread next! Hi! I’m sorry, but I might have missed this, when do you add in the creamy peanut butter? Do you mix it with the butter first? I didn’t include peanut butter in this recipe but you could add a 1/2 cup of creamy peanut butter and mix it in when you add the mashed bananas. I am making it right now ! Thanks for the recipe ! I can’t wait to try it. 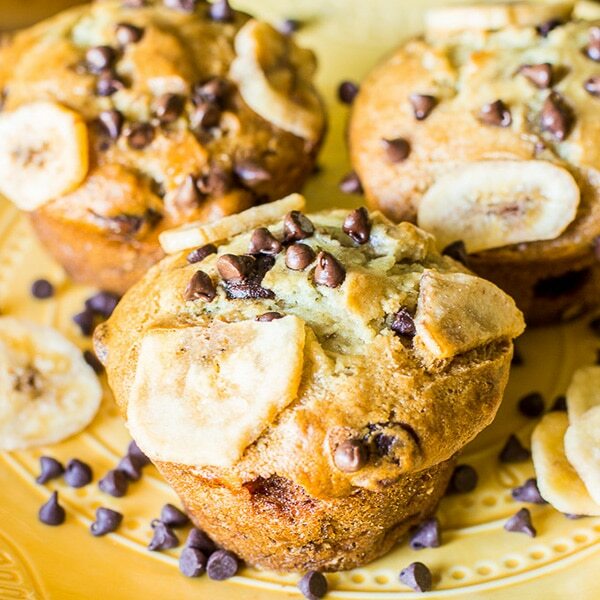 My favorite part of these delicious muffins are the tiny chocolate chips and banana chips on top! Such a great idea! 🙂 Pinned! I just made these today and they were wonderful! They turned out perfect and my whole family loved them! 🙂 Thanks for the recipe! I know several people in our house who would go crazy over these! I love the banana and chocolate combo! I adore banana chips. These are calling my name. I love all the banana flavor you’ve injected into them. I can’t tell you how much I love that you used dried banana chips on these yummy muffins! So creative! I am OBSESSED with muffins and these have all of my favorite things! So pretty too 🙂 Pinned! Jam packed full of flavors, how can you go wrong. Love that you use banana chips! I wish I had some of these around for an afternoon snack! These look delicious 😉 I love chocolate chips also, perfect for a chocolate craving! I love the banana and chocolate combo – perfect!